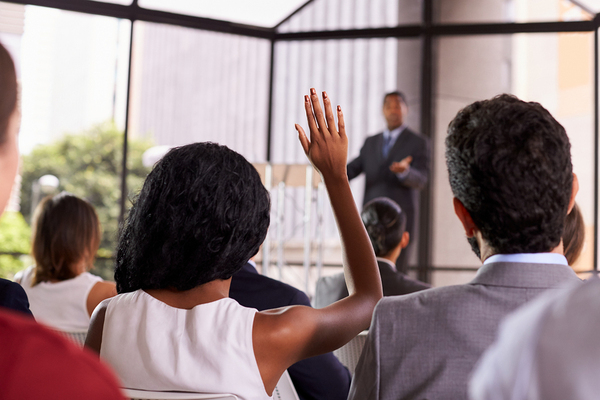 Becoming a good business speaker requires understanding the basics of crafting a message to fit the allotted time, speaking clearly, and using immediate audience feedback to fine-tune as you go. However, exceptional business speakers do more. They surpass even good business speakers by taking skills to the next level, caring deeply about the audience, honing word choices, and practicing at every opportunity. Do you have a business speaking opportunity in your future? If so, you can learn from the practices that set the best business speakers apart from the rest. Here are five top habits of great business speakers that you can incorporate into your presentations. Tone-deaf presentations are painful for everyone. Whatever you can learn about your audience in advance of your speech, do it. How big is the venue? How full is it likely to be? Will you be speaking to seasoned managers or new hires? How technically savvy is the audience? What time of day will you be speaking? Will audience members all be local, or will they be from a variety of locations and backgrounds? When speakers choose nouns and verbs that carry their weight, they can be more concise and more interesting at the same time. Relying too heavily on “-ly” adverbs (softly, loudly, freshly, greatly, etc.) can render a good speech tedious, and a descriptive noun always packs more punch than a “zombie” noun modified with an adjective. Getting rid of unnecessary adjectives (Do you really need to refer to it as a “dark night”?) keeps things moving without compromising meaning. Standing behind a lectern and talking for half an hour isn’t easy for business speakers or audiences. If you can’t break up your presentation with interesting graphics or audience participation, at least move around. Body language in public speaking is in itself a skill, one you can practice and improve. Move when you transition to a new message, and punctuate essential messages with a split second of silence before and after. Lean toward your audience to communicate key points. Memorable and affecting speeches are dynamic. Great speakers are who they are. They don’t try to adopt speaking styles that aren’t authentic to them. Knowing your audience is one thing, and it’s important. However, pandering by trying to be what you think they want you to be can backfire spectacularly. You may be talking to an audience of new hires who are half your age, but that doesn’t mean you try to adopt their lingo by studying Urban Dictionary the night before. A great speech and a great speaker comprise a unified entity. Don’t think you can wing it. Perhaps an exceptionally experienced and beloved speaker can do so once in a great while, but even that is rare. Business speakers who make an impact plan their presentations to the last detail, and they practice. They may practice in front of friends, in front of a camera, or in front of whoever they can round up at a given time, but they practice. They listen to feedback and believe what video and audio recordings tell them. Perhaps they join a local Toastmasters group or volunteer to speak to their Chamber of Commerce. The point is, they practice their craft. Business speakers can inform, inspire, and motivate audiences, and that’s why they’re sought to kick off business initiatives and deliver keynote speeches at industry functions. The best ones leave the audience better off than they found them, and are well worth seeking out. Business speaking has been an important part of my career as a business leader, coach, and author.